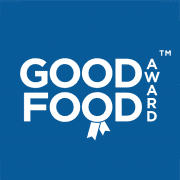 Chapel Cafe Port Isaac, Port Isaac Pottery, Roscarrock Hill, Port Isaac have now been awarded our highly revered Good Food Award – Gold Seal for 2019. Our Gold Seal is the highest accolade bestowed by the Good Food Awards and is reserved to those achieving our award for three consecutive years or more. Premises must maintain the same exceptional standards that gained them initial entry into our awards over a three year period. Truly making this achievement the marque of distinction. These premises have demonstrated exceptional levels of food quality, service and value when compared to our industry benchmarks in their category and have now maintained this formidable standard for three or more consecutive years. Chapel Cafe is in a beautifully restored 19th century Methodist chapel on Roscarrock hill in the heart of the picturesque village of Port Isaac on the rugged north Cornish coast. We are now in our Third year as an addition to the family run business of Port Isaac Pottery. Our passion is simple local food & drink and great service! We prepare all of our food on the premises. Suppliers are carefully chosen for their produce, quality and ability to deliver little and often, to keep our produce fresh. Wherever financially and practically viable we will always aim to buy locally benefiting our local community in Port Isaac & in Cornwall as a whole. Our Coffee is locally roasted exclusively for Chapel Cafe, ethically-sourced from Olfactory Coffee Roasters. Our staff are fully trained to ensure you get a great cup of coffee every time. Served in one of our own mugs made here at Port Isaac Pottery. We aim to provide our customers with quality, well cooked food or a professionally prepared beverage, sourced from local producers and suppliers at reasonable prices. We encourage our staff to portray their own personalities in their work which enables them to enjoy what they do and make for a relaxed and informal experience.